Military missions certainly differ from civilian missions in a number of ways. For one, the level of support available in military operations is sometimes nonexistent, but as a rule at least significantly less than you could reasonably expect to find at a commercial airport. What exactly does this mean and entail? Military operations might be anywhere that has pavement long enough to operate on (sometimes not even that much). These may be international airports which have full terminals and maintained aprons, or utterly unimproved airstrips. Some forward airfields are considered “bare base” which means that there is no infrastructure available whatsoever. It is often difficult to predict everything which may go wrong or will go wrong, and the bulk of the logistical train is directed to the aircraft, since they are the most important asset and are at the heart of military airfields. Understandably, military ground support equipment items are expected to work well under all extremes. Parts and components take up space and add weight, so the space for spare parts is prioritized to aircraft parts. What’s the difference between military specific GSE and civilian? This is a broad question without any single specific answer, because there are so many different types of military aircraft. Some military aircraft are direct derivatives of civilian aircraft and require no special equipment at all; all GSE for these can be easily acquired through civilian channels. On opposite extremes, tactical aircraft (fighters, attackers, bombers) share very little in common with civilian aircraft, if anything at all. They often have different power requirements to run their enormous electrical systems, and along with those are requirements for cooling system equipment. The extremely powerful offensive and defensive avionics systems can overheat in sometimes less than two minutes. Towing tactical aircraft presents unique challenges. These jets often share no commonality with even comparably-sized civilian aircraft, and many examples weigh far more than a similarly dimensioned civilian aircraft. This demands sturdier, i.e., heavier, GSE for the tactical aircraft. Since tactical aircraft deploy in large squadrons, their GSE and logistics must all be carried as freight. It takes considerably more energy to transport dimensionally larger and heavier GSE items, particularly a tug. Outside of weight and measurements, military aircraft carry numerous items which change their demands over civilian aircraft. Tactical aircraft generally carry their weapons on exterior stores called “hard points”. These are universal points affixed to the fuselage and are used for hanging weapons, auxiliary fuel tanks, and electronic warfare pods. What exactly does this mean for GSE? The GSE may not fit or work exactly, and traditional tow bars and tugs may not work properly without interfering with the external stores. The remotely controlled electric tug is the ideal solution. Compact in size for storage and travel, and made to adapt to all sorts of aircraft, conditions, and missions. The same tug that is used for towing a cargo plane can turn around and tow a small fighter with ease and no additional equipment. In austere environments, keeping the equipment inventory to the bare minimum is of the utmost importance. Any opportunity to use a single piece of equipment to cover a broad array of tasks is highly desirable. So what does military ground support equipment need in order to function effectively? Stealth and cloaking devices, of course. No, that is just a joke. There is nothing about the aircraft tug which will require any sort of advanced coatings or stealth technology. No, much more importantly the tug must be durable and utterly reliable. It must be fully operational all of the time, and it cannot be temperamental or finicky. It just has to work. And it needs to be simple. Military aircraft technicians do not need to worry themselves with a difficult, complicated system when all they want is something that moves aircraft easily. They work a lot of very long hours on complicated machines; what they do not need is a complicated piece of machinery which doesn’t like to work in certain climates or conditions. Furthermore, military GSE needs to be quick and simple; the quicker and simpler the better. Mototok tugs couldn’t be much quicker or simpler. With no external tow bars, mooring chains, or other devices, it attaches in an instant and is utterly secure. It also only takes a single person, which is wonderful for military ops; these are operational environments where the difference between a single extra man might be the difference between a sortie being generated and a sortie being lost. A lost sortie might mean a gap in close air support, which might literally mean the difference between life and death for ground forces. Not everything you find at a military airfield is going to be found at a local FBO or commercial airport; this is simply due to military aircraft being equipped with items which have no translatable purpose or use in the civilian market. This is also why military airfields are marked and equipped with a number of items which are alien to strictly civilian pilots. The most common pieces of GSE you will find strictly during military operations involve all of the different pieces used to load ordnance. What exactly is ordnance? Good question. Ordnance are all of the bullets, bombs, missiles, chaff and flares which aircraft carry. Ordnance is essentially all of the items which make a tactical military aircraft what it is. The GSE used to load ordnance is numerous and various, depending on what sort of ordnance is being loaded. Bombs, external fuel tanks, and large electronic countermeasures (ECM) pods are all very heavy and also very sensitive so they are loaded using an aerial munitions lift vehicle, which is commonly known as a “jammer”. These hydraulic loaders are a modern mini-might; they are very compact yet lift enormous loads. They are incredibly agile, yet very stable. Most importantly they are able to lift their loads overhead perfectly level, an important feat considering how delicate (and costly) their cargo is. Aircraft cannon munitions are interesting to observe being loaded. Each aircraft holds somewhere in the ballpark of 500-1,000 rounds of linked projectiles, and yet they are able to be loaded in just a few minutes. The loading system is a small trailer which feeds the linked ammunition into the storage container in the aircraft. You will be hard pressed to find anything like this at the local airport! Without going too far into specific pieces of equipment, it is very important to understand that there are far few pieces of generic equipment capable of servicing a wide array of aircraft. While airliners certainly are not all the same, they are generally all designed to use common support equipment like power carts, oxygen carts, nitrogen carts, etc. Major airlines tend to operate aircraft by more than one manufacturer and would rather not have to buy separate GSE for each make and model of aircraft. 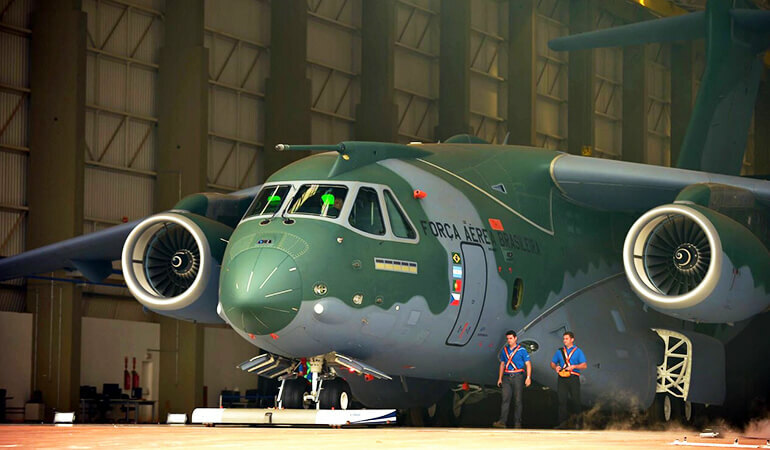 Military aircraft are often tailor made for one or two specific functions and may have very specific ground support requirements to make that happen. Some aircraft which are even based on commercial designs, such as the venerable E-3 Sentry based on the Boeing 707, requires a massive auxiliary air conditioning unit to cool the enormous electronic packages when they are operating on the ground. Also, many military aircraft use fluids and coolants which are unique to that specific aircraft. These are the reasons why it is advantageous to the military unit to purchase truly universal GSE wherever it finds the opportunity because so many logistical resources will be expended in providing equipment unique to each aircraft mission. Military aircraft and aviation operations are a very different animal than civilian. The operational tempo is faster, the environment much harsher, and the stakes incredibly important. Dedicated military GSE must be utterly reliable and dependable, simple to use, easy and quick to learn. Manpower in military operations is always a commodity in high demand but short supply, so providing GSE which can free up hands while improving safety and efficiency can change the operational landscape for the better. The one piece of GSE which is used daily and provides an immediate impact is the aircraft tug. Choosing a remotely operated tug with numerous built-in safety features may provide the edge in putting sorties in the air vice sitting bottlenecked on the apron. Get in touch with us today and we’ll find the ideal solution for your military aircraft operations!